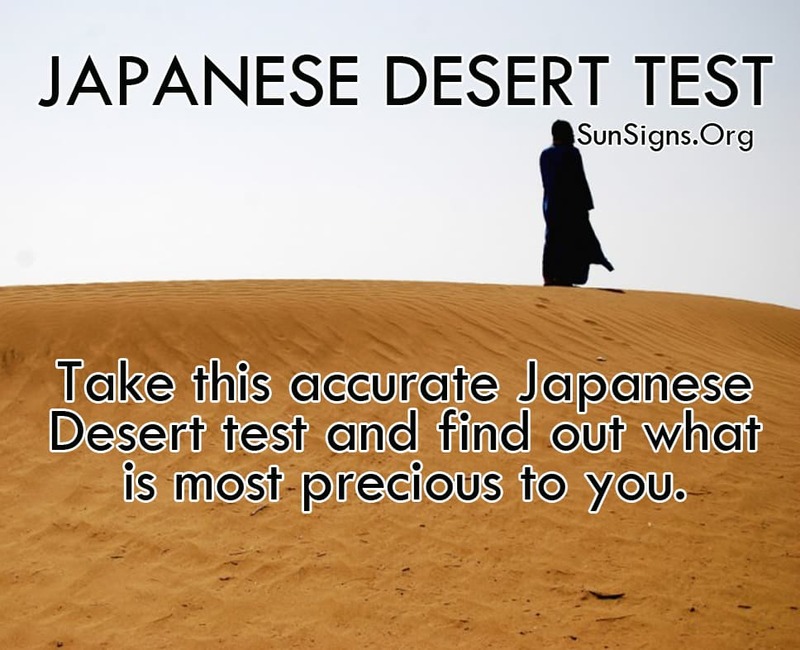 Take this Japanese Desert test and find out what is most precious to you. This will help you to analyze what your priorities in life have been up to this year in 2014, and will show you what you might want to change for 2014 – 2015 to live a better life. This test gives great insight that is different than a zodiac horoscope. Besides what the star signs can reveal, this is a test of choices and virtues. The desert test will help you to understand what you see as more important in life. How do you compare your priorities when it comes to living in harmony? This Desert test is a psychological evaluation of your personality. Its purpose is to pin point the characteristics of your personality that you hold most dear. The prediction is based on animal archetypes of the Japanese. By answering several questions based upon what you would choose to do in a hard situation in life, you are shown what you value most and what you value least. Different values and people are shown to you in the form of 5 different animals. The Japanese animal archetypes are Lion, Cow, Sheep, Monkey, and Horse. This Desert test is a symbol of a complicated situation in the journey of life. Each of the different animals represents a special characteristic of your personality. The first animal that you desert signifies what is of least importance to you. The last animal that you allow to stay along with you on your journey is the characteristic of your personality that is most important you. The Monkey represents your Offspring. The Lion represents your Dignity. The Cow represents your Simple Wants. The Sheep represents your Friendship. The Horse represents your Obsession. The animals that you choose in a particular order are a representation of what you give most importance to in your life. This shows what you have been believing to hold the most value in your life. This is the kind of test that opens up your mind in a way to make you see how you prioritize your life. After taking this test you can figure out if you need to reevaluate your life priorities to progress in a more harmonious way.